We are a leading exporter of quartz boat. The material of the quartz boat we supply is quartz glass.We can produce the Quartz boat according to the drawing.And we can also design the drawing According to the application. We can Supply Qurtz tube from Quartz Tube : 2 mm OD - 650 mm with a Wall thickness : 1 mm - 10 mm which has Strong Corrosion resistance thermal stability Good electrical insulation. Color: Quartz occurs in virtually every color. Quartz boat is made of ultra-high purity quartz . 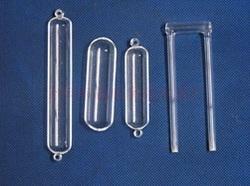 - Quartz boat is made of ultra-high purity quartz. - Quartz boats can be manufactured as per your requirements.